Washington, DC (September 20, 2010) - Washington International Horse Show (WIHS) is thrilled to announce that noted American folk artist Dagmar Cosby of Vienna, Virginia, has created the art poster for the 52nd annual Washington International Horse Show. 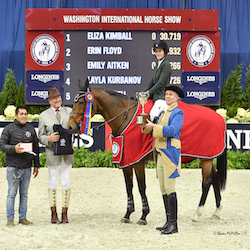 “Dagmar has created a poster that encompasses all of the elements of the Washington International Horse Show; we are thrilled with her design and all it represents,” said Juliet Reid, President of WIHS. The poster was unveiled at an evening cocktail party at J. McLaughlin in Georgetown and will be available at the souvenir booth during the show as well as at the show website, www.wihs.org. In addition, Cosby will have a boutique on the concourse selling pieces from her collection. WIHS takes place October 26-31 at Verizon Center. For the Washington equestrian community, Cosby’s work may look familiar. This is the third poster she has designed for the Washington International, having created the art posters in 1988 and 1989. Cosby’s 2010 design was selected out of more than 40 entries in the inaugural WIHS poster contest. With a diverse equestrian background, Cosby loves the horse world, having taken part in everything from dressage to fox hunting and riding clubs to a cowboy roundup! She learned to ride as an adult and has depicted her love of the horse world through her art. Horses are only one of Cosby’s inspirations. Having grown up in a military family, Cosby, whose father and grandfather graduated from the Naval Academy, finds the WIHS connection to the military and the Caisson Platoon personally touching as it brings together two of her passions. The Caisson Platoon is featured in the WIHS poster. One of her memorable works, titled “The Old Guard,” depicts the Caisson Platoon at Ft. Myer, which she was moved to paint after attending a burial at Arlington National Cemetery. About Washington International Horse Show: The Washington International Horse Show is a unique and storied equestrian event held annually at Verizon Center in Washington, D.C. For news, photos, event information, visit www.wihs.org. Join us October 26-31, 2010, for the 52nd WIHS! The Washington International Horse Show (WIHS) is one of the leading equestrian events in the country and hosts the top horses and riders from around the nation and the world in the last great metropolitan indoor horse show.